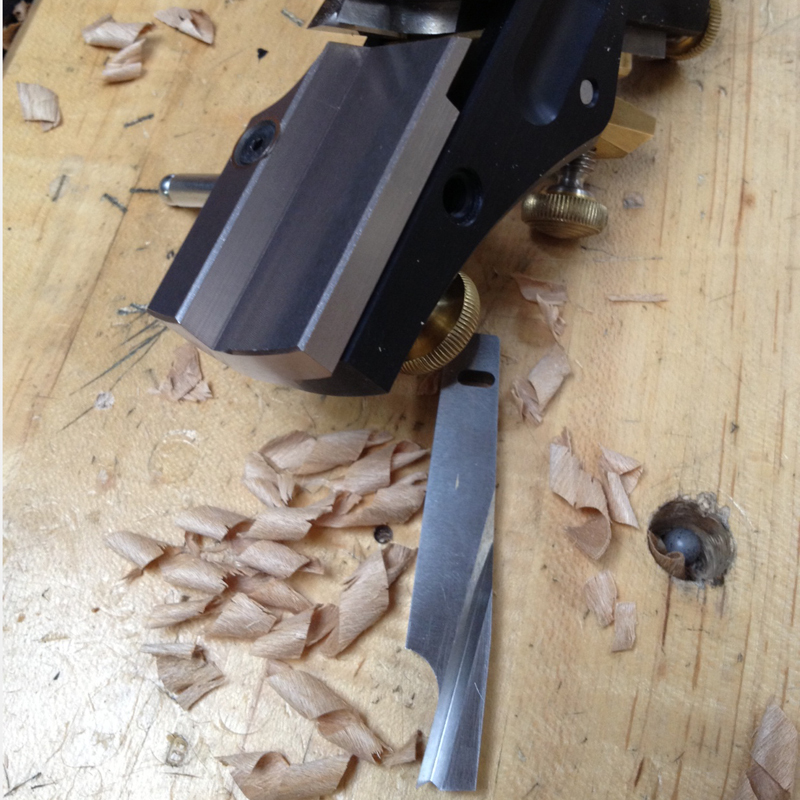 12/6/12 – The Dovetail Irons are being worked on and I was told today that we should have some in hand in 2-1/2 weeks. The iron is the trickiest element to this system. Everything else is rather rudimentary in it. The extrusion die for the Sliding Parallel starts up shortly. 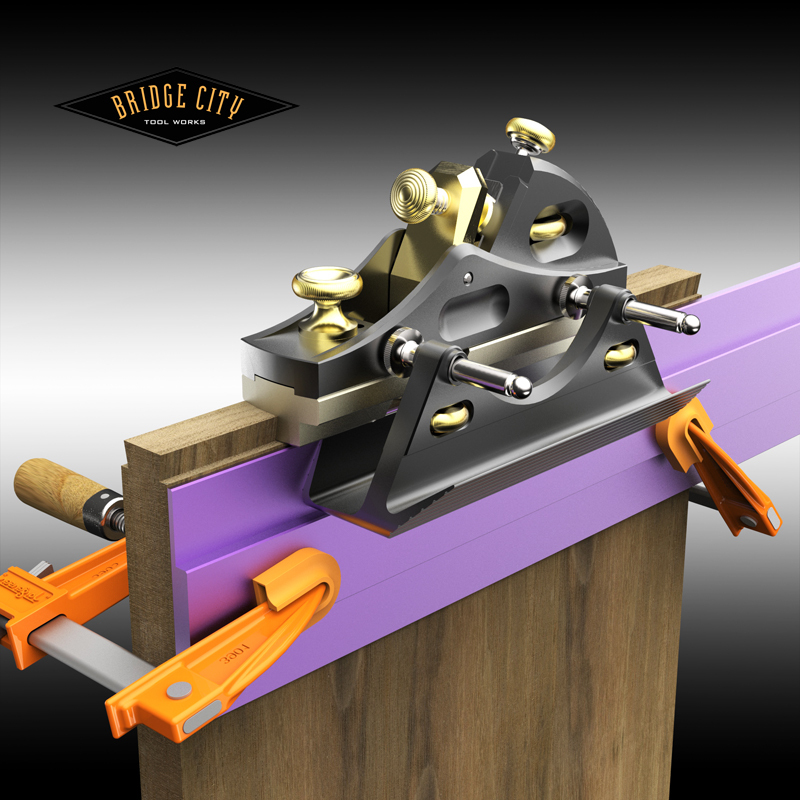 Meanwhile, you all need to be drafting up some stunning designs using the strongest coolest joint around! 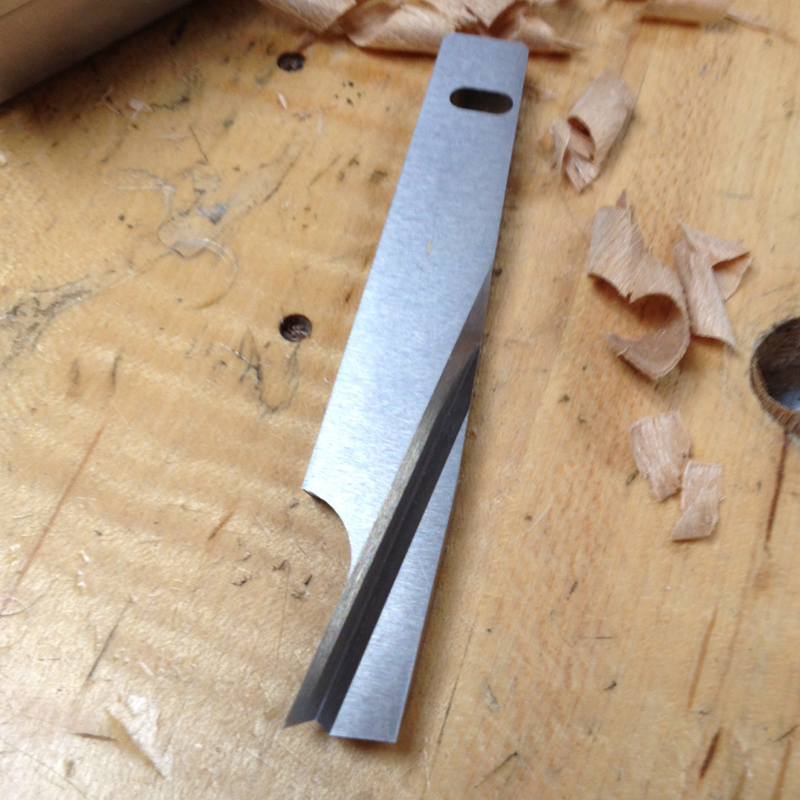 12/13/12 – First articles for the Dovetail soles are in. We also received the crucial scoring cutters that are the secret to the whole system. Heat treating and anodizing the samples are next which will time nicely with the irons. Aluminum soles are a nice change from the brass. It is quite a change in weight. 01/03/13 – We should have a complete test kit ready to roll early next week. Production parts are moving along. 01/17/13 – Final tests are occurring on the geometry with actual first article parts. Pictures soon! New bodies and other parts are in the works. 02/07/13 – Irons are modified and good to go. The Initial cuts were quite good. The scoring cutting on the bottom gave incredibly smooth shoulders. The aluminum soles are good looking too..the brass may go away for good. 02/21/13 – The Sliding parallel and accessories are underway. We have more HP-6v2 bodies in the works too. The parts for the dovetail system are in the queue with the machine shops. Still not in full production mode yet. 02/28/13 – Final iron are being worked on. The HP-6v2 bodies are being wrapped up. The knobs and turned parts are underway. Different shops to do the bodies, from the brass turned parts and then the steel threaded parts. A swiss screw machine is making the threaded parts. I’ll see if I can track down a picture of the machine next week. 04/25/13 – Sorry about the lack of updates here. Just a couple last knobs to make for the HP-6v2 body. The extrusion metal is just about done for the Sliding Parallel. John is finalizing a couple of last minute things on the rest of the system. 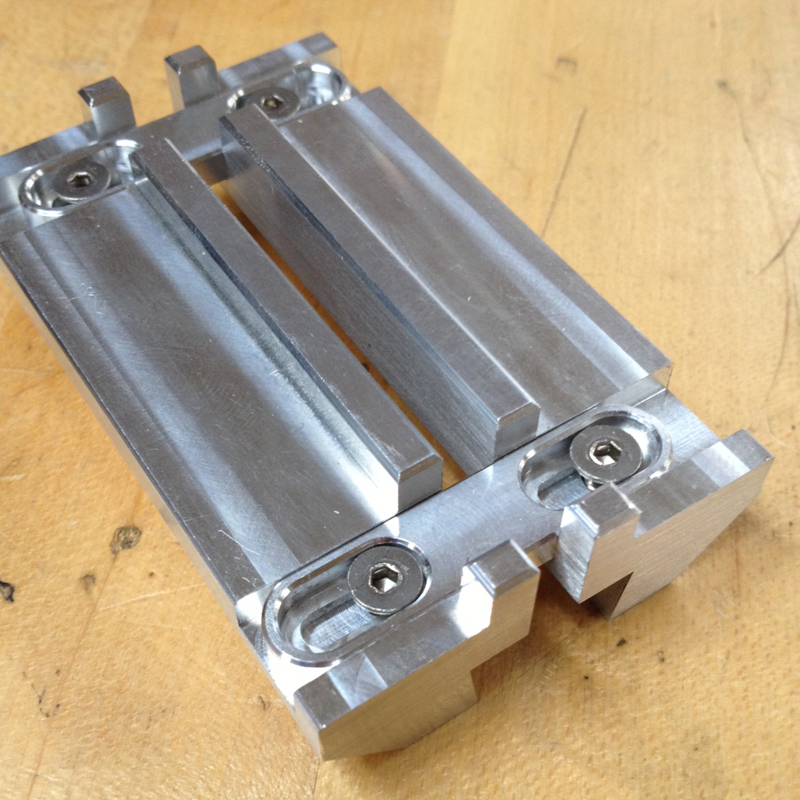 05/30/13 – The SP-26 metal is done and ships to the machine shop next week. The HP-6v2 bodies are done and are shipping out. The Dovetail System is moving along and getting staged in various machine shops. 06/20/13 – Lots of parts coming off the machines now. Some of the Dovetail Calipers and other parts start to go to anodizing next week. The soles are machined already too. 07/11/13 – Most of the parts are at the anodizer now. The Depth Fences and the parts for the SP-26 are not yet. But will be soon. We received first articles on the irons and they work great. Shavings on end grain even! 07/18/13 – Anodizing is still going on. The Depth Skids just finished up. They will go to the anodizers on Monday too. Sliding Parallel is still moving along. 08/01/13 – Picked up lots of parts at the anodizer this week. I also dropped off the Sliding Parallel extrusion material there too. 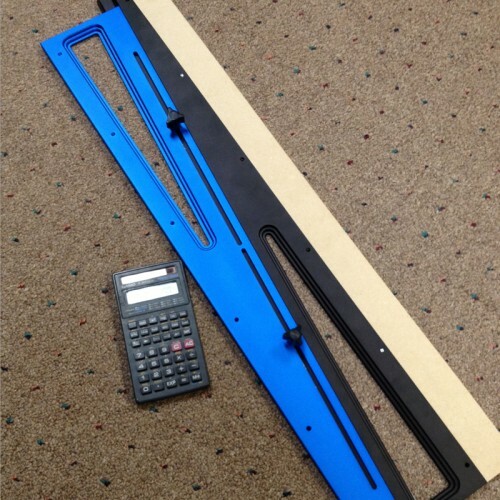 The angle iron pieces and mdf spacer are still in the machine. I need to finish the laser artwork some of dovetail accessories as well as get the packaging sorted out. This museum show in 2 weeks is throwing a wrench in to my schedule. Hey, where does that saying come from anyway? Without google, does anyone know off the top of their heads? Maybe Edward Abbey and his Monkey Wrench Gang? Anyway, I’ll have pictures next week of the anodized parts. Irons are just about to be packaged up in California. I have an amazing shop down there to make most of the irons for the HP-6v2 and as well as some of the other plane irons. 08/22/13 – The SP-26 Sliding Parallel is at the laser facility. I had a special guest, Mr. Paul-Marcel, help us out with the laser artwork. It is a neat little device, actually not that little. Lots of other parts at the laser guy too. I hope to get these shipping within 2 weeks. Depth Fences are done and look great. Someone mentioned swapping all of the brass parts out for the Champagne colored anodized aluminum. It would look pretty good actually. I’ll give it whirl one of these days. 09/05/13 – Still lasering some of these. Scoring cutters are still en route. Final packaging should start up in 2 weeks. Here is a shot of the non-lasered SP-26. 09/12/13 – Dialing in the foam diecut to fit everything tightly. Parts are looking good. 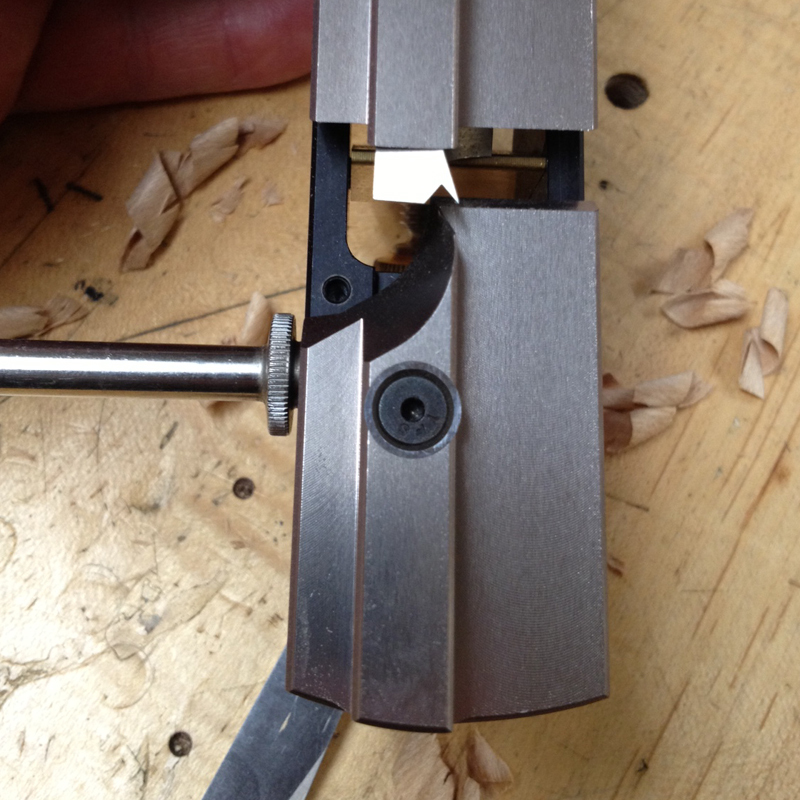 Male Dovetail Guides and scoring cutters are the missing elements at this point. 09/19/13 – Laser on the SP-26 is wrapping up. They still need to do a few of the smaller pieces, as well as the Metric versions.The Male Dovetail Guides will go to anodizing on Monday. 09/26/13 – All of this should start shipping by October 10. Lots to do, mostly packaging. AND the video that needs to go along with this system. 10/03/13 – Looking good for wrapping things up next week. 10/10/13 – Packaged and ready to go. Shipping starts on Monday. This system is UNBELIEVABLE! It cuts so well. Incredible. 10/24/13 – Most of these went out this week. Instructions still need to be updated, but check John’s Blog for the low down. We do have some Deluxe kits left, but we are out of the SP-26 Sliding Parallel. We will be making more of these and may open them for Pre-Order shortly. 6/24/14 – The tool is still currently in production. Estimated ship date at this time is in August. 7/29/14 – All orders have been fulfilled and we have a few extras of these and the SP-26 Sliding Parallel! Too bad that you are discarding the use of brass and wood from your tools. These ,materials have more classic look than aluminum. Any guesstimate on how long the bodies will take? John do you have any guestimate on when the new HP-6v2 bodies will be done? I suspect that there are a number of people out there like me who bought a basket full of profiles during the super-sale (thanks again!!) but cannot use them until the bodies are done. Now that I see a projected delivery of hp6v2 bodies, do you have any plans to repeat profiles (specially dado and ogee) in the near future? Or create new ones too. I think that the original expression was “throw a monkey wrench into the works”. Back in the early days of the industrial revolution, the machinery often had big exposed gears. If a wrench fell into them, it could jam them, and bring the whole machine to a halt. There’s a nice example of it in an old Charlie Chaplin movie (“Modern Times” I think). P.S. Really looking forward to the plane!! Woo hoo! Looks like October/November are going to be banner BCTW months!